“Adolph Hitler” Campbell – What’s in a Name? It began as a traditional birthday – including a cake with the child’s name on it in frosting. 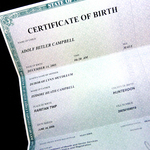 But a New Jersey store denied the mother’s request to spell out her three-year-old son’s name — Adolph Hitler Campbell. Another store agreed to do it and the child’s party was held. The boy’s father explained that he liked the name and that no one else in the world would have it. Adolph has a younger sister named JoyceLynn Aryan Nation Campbell. Although World War II ended over sixty years ago, do you think anyone has forgotten about the Holocaust or the reign of Adolph Hitler? Should parents have the right to name their child anything they like? What can the child do if he or she doesn’t like their name? What would you do? See “Can I change my name?” for more information on this. Most states, including New Jersey, have ‘name change’ laws. Most states require you to be 18 unless you have the consent of your parent or guardian for the change. Check with your local librarian for more information about the laws in your state. Update: In February, 2017 Heath Campbell filed papers in superior court in New Jersey requesting a name change for himself. He’s asking for his last name to be “Hitler.” A hearing is scheduled in March, 2017.